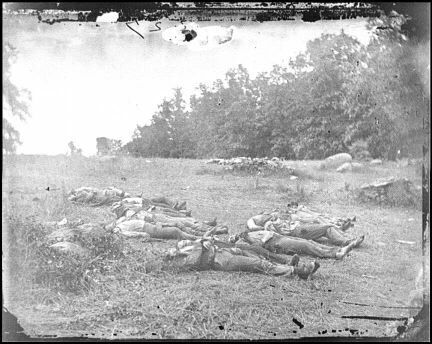 This is a photograph of a Confederate dead at the Rose Farm near the Wheatfield. After taking the Devil's Den, John Bell Hood's division began pressing Daniel Sickles' III Corps through the Wheatfield. The fighting, often hand-to-hand, was bitter and bloody, with the Union troops contesting every inch and the Confederates making charge after charge. Thanks to Glenn Spickler for corrections regarding the photograph.